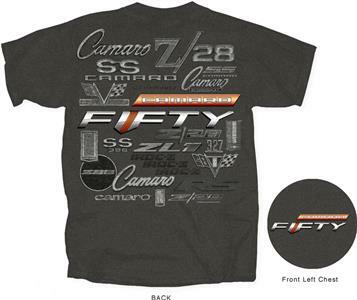 The "Camaro 50th Anniversary Logos T-Shirt" was produced to celebrate the camaro's 50th birthday, and features a large image on the back of "Camaro Fifty" logo plus badges from a host of different badges from Camaros and thier variants through the years, including SS, ZL1, 327 and Z/28. Their is a small "Camaro Fifty" logo on the left breast. This is all printed on a high quality, pre-shrunk, 100% cotton Gildan t-shirt in mid grey, and is fully licensed by GM.